Naturopathy is the mother, all-inclusive, of natural therapy. It is the basic platform for all methods of healing: without it any healing art will be a failure. Naturopathy - The treatment of disease by natural means in order to assist the body to heal itself. Naturopathy became the result from the philosophies of nature cure, homeopathy, spinal manipulation, and other natural therapies, which evolved in the United States. Hippocrates (460-377 BC) is probably one of the earliest nature cure physicians since he taught that the body has an innate ability to heal itself. He was credited with saying nature is healer of all diseases. After Hippocrates there was another early proponent of natures healing properties, a Jewish philosopher, scholar and physician Maimonides (1135-1204) who received very little attention as a practitioner of holistic medicine during a time of medieval medicines of superstitions and religious dogma? He prescribed some modern holistic practices we generally ascribe to current thought. He believed, The physician must keep in mind that the heart of every sick person is narrow and that every healthy person has an expanded soul. Therefore, the physician must remove emotional experiences that cause shrinking of the soul. And in order to strengthen the vital powers, one should employ musical instruments and tell patients gay stories which make the heart swell and narratives that will distract the mind and cause them and their friends to laugh. One should select as attendants and caretakers those who can cheer up the patient. This is a must in every illness. And we thought Norman Cousins was the first to prescribe laughter as a medicine for illness. Cousins did the scientific research to prove the benefits and documented the results as a powerful force in healing. Maimonides also challenged the physicians of the day on the importance of drugs and surgery and argued that diet, exercise, and mental outlook were the key elements for attaining health. He understood the fountain of youth lies within us in our lifestyles and not from an external source as Ponce-deLeon spent a lifetime searching for. 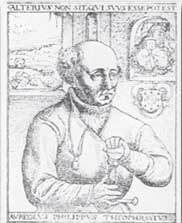 Another important figure in the history of medicine was Paracelsus (1493-1541) coming at a time when we were evolving out of the medieval dark ages into the period of the Renaissance and the enlightenment, which followed. He burned the medical textbooks of the time in a public display of revolution against the medical practices of the day. He advocated the practices that if you keep the wounds clean they will heal. He said; If you prevent infection, Nature will heal the wound all by herself. In addressing his fellow physicians; Nature is the physician, not you. From her you must learn, not from yourself; she compounds the remedies, not you. Paracelsus also saw that Nature was a two edged sword; Each natural disease bears its own remedy within itself. Man has received from nature both the destroyer of health and the preserver of health. He was referring to the destructive power of Nature as well as the healing power. Many Nature Cure physicians broke with the current medical community because of the physicians inability to cure the illnesses they were personally experiencing. The person considered the Father of Naturopathy for America was Benedict Lust (1872-1945) who was born in Germany and came to America in 1892. He became ill and developed an acute case of tuberculosis as a result of several surgeries and six vaccinations that were enforced on him. After the attempts of many American physicians to cure him, the last physician made out his death certificate in Lusts presence; he decided to return to Germany to die in his homeland. He managed to travel to see Father Sebastian Kneipp a student of Priessnitz who carried on and expanded Priessnitzs techniques, developing what became known as the Kneipp Cure. After listening to Lusts story the Father said; I dont know whether I can put you back together again or not, but I will see what we can do. Under Kneipps care he regained his health within eight months. Kneipp authorized Lust to take his techniques back to America as his official representative, thus beginning Naturopathy in America. He combined Kneippism with other nature cure practices and established a school, a clinic and a magazine. He didnt repudiate the Kneipp Cure but expanded it making it even more successful. As you can imagine, the growing popularity of Lusts naturopathy caused conflicts with the current medical community in America. Lust believed that the naturopaths purpose was to reach and transform and transfigure everyday lives. He felt that all diseases arose as a result of the violation of natures laws and that all of natures creation could be used to heal the disease. His definition of naturopathy was; a distinct school of healing, employing the beneficent agency of Natures forces, of water, air, sunlight, earthpower, electricity, magnetism, exercise, rest, proper diet, various kinds of mechanical treatments, such as massage, osteopathy, and chiropractic, mental and moral science. Lust had many accomplishments for the furtherance of nature cures not the least was his eventual victory over the power of the medical community. He wrote; Without free competition in the art of healing, the American people will be deprived of their unalienable rights under the constitution to select the method and, the doctor of their choice and to have the best in the prevention and cure of disease. More than forty years after his death we began to see the emergence and acceptance of this right. It has been a hard fought fight but Americans are beginning to enjoy the benefits other parts of the world have enjoyed all along. In the next issue we will begin to look at the field of Naturopathy and how it impacts the medical choices we have today as Americans.